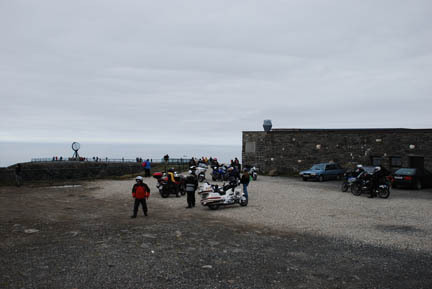 Nordkapp is the northernmost place one can drive to on this earth without using a snowmobile or ATV. It is a huge tourist draw and really has no other purpose (there are a couple of tiny fishing villages). 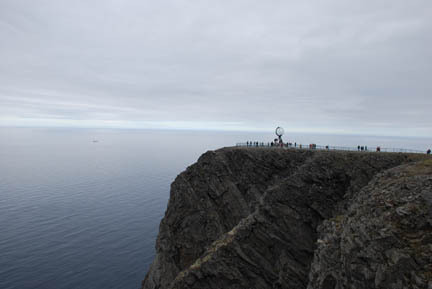 The word Nordkapp translates as "North Cape", and that is all it is, just a rock sticking out into the Arctic Sea. But it has been a tourist draw for 300 years! 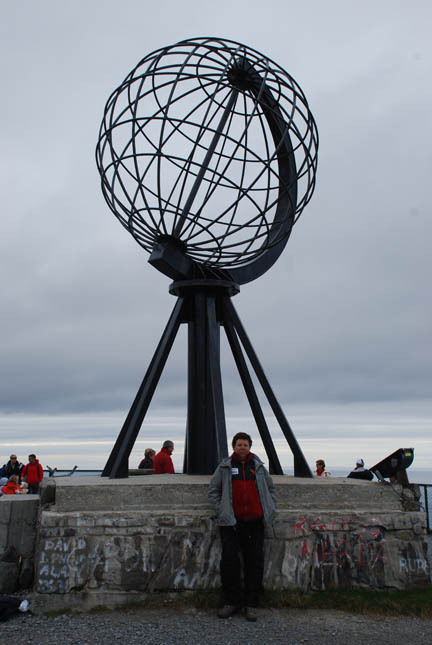 On this page we'll include not only Nordkapp itself but our ride there from Tromsø and onward to the Finland border. We awoke in Tromsø to rain and proceeded to pack. All the cabins in the campground were full so we had stayed in our tent. 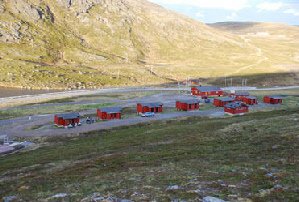 This campground, like so many others in Europe and the US, put the tent campers (who do not have indoor plumbing) farther away from the toilet/shower buildings than the campers in trailers or motor homes (who do have indoor plumbing). Not only were we farther away, we were on the other side of the stream, crossing by a small footbridge. This made packing in the rain interesting because we had to pack each item and then carry it across the bridge and put it into the trailer while trying to keep everything dry, a slow process. 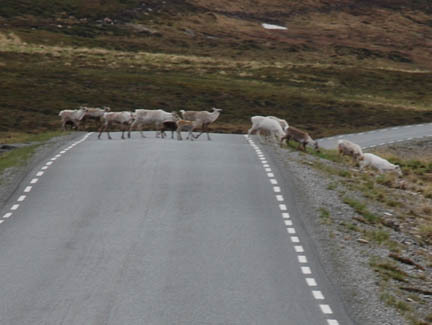 But we made it and got on the road north towards Nordkapp. 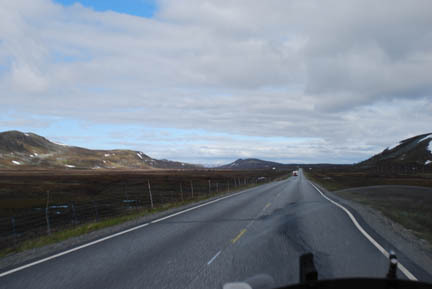 We followed the edge of fjords north and east for several hundred kilometers. 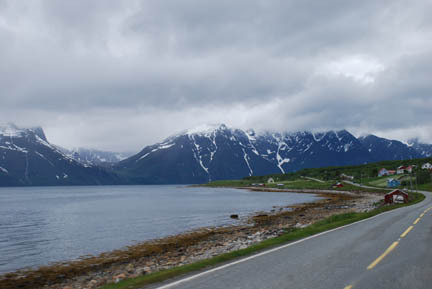 The fjords have gotten steep sided again and have fishing and farming along the shore. It is a very beautiful area, but cold and the low clouds are hiding the sun. As we traveled the rain stopped and the sun did peak out occasionally. 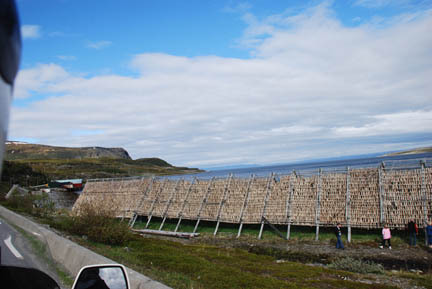 Along the way we saw the racks on which they dry their fish to preserve it for eating in the winter. We saw lots of these racks and all but this one were empty and most looked abandoned. There was a tour bus here and this one may have been more of a tourist attraction than an actual process that is practiced in these times with other ways of preserving food. We did see the dried fish for sale in grocery stores, so it is still a food source to the Norwegians. An interesting side note on food. All, and I mean all, grocery stores have a Mexican food section. The larger the store, the more shelf space, up to 3 meters (10 ft.) wide and all shelves top to bottom. Mostly Old El Paso brand products, but the Norwegians must like Mexican food a lot. This is great for us because we do too! This was a day for interesting transport. 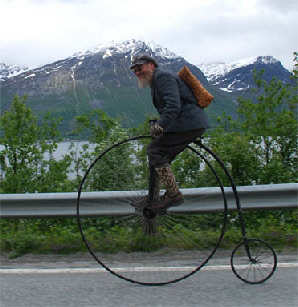 We passed this man on his high wheel antique bike and all dressed in clothing from the same time period. His backpack is made from thin strips of wood woven together like a basket. We also passed two people on recumbent bikes, but Kathy missed them with the camera, and lastly the guy with the ski/skates. 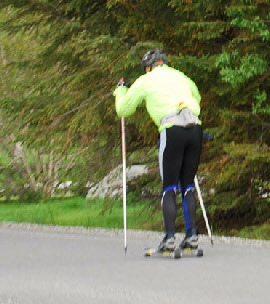 He is wearing flat boards that are about two feet long with one wheel at each end centered in the board and using ski poles. These seem to be popular as we have seen several people using them. 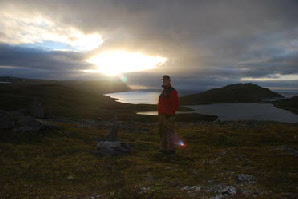 As we went north we crossed from one fjord to another by going up into an high tundra plateau where the wind just howled past us from the west. The wind is from my left and I am leaned into it heavily in order to run straight down the road. When an oncoming vehicle, especially a tour bus or truck passed me, it blocked the wind. This meant we were suddenly going left, meaning I had to straighten up. But just for a moment, when he passed we were again hit by the wind and I had to lean over sharply again. It was an exciting time, especially with multiple oncoming vehicles requiring us to bounce upright and lean sharply repeatedly. We saw lots of Reindeer. And we got the camera out in time to take pictures. But we did not need to worry, unlike the moose, we had many opportunities to take pictures, they are everywhere up here. 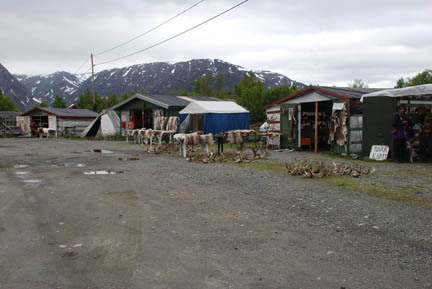 We stopped at the Sami tourist shops in the pass in the tundra. 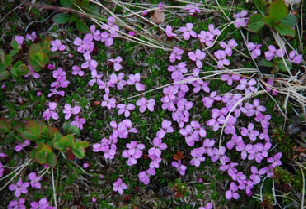 It was not a hospitable spot with the wind and cold but they were open. Reindeer skulls with antlers, reindeer hides (which are very soft), and handcrafts were all displayed for sale. Kathy bought some embroidered slippers. 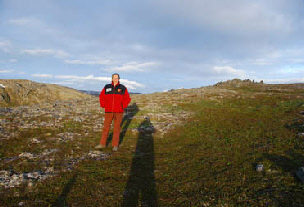 Nordkapp is on an island with an undersea tunnel leading to it. The tunnel is 7 kilometers (nearly 5 miles) long and goes 212 meters (700 feet) deep and cost 117 Nkr (Norwegian kroners) (about $23) and we have to use it again to get out of here. 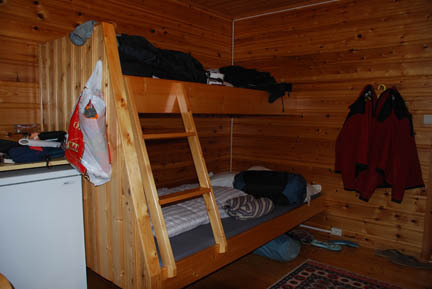 This time we were able to rent a cabin, 450 Nkr. ($90) per night with two bunk beds, one large enough for two, a hot plate and small refrigerator. You'll notice I did not list a toilet or shower, they're in another building about 150 feet away. This is essentially a tent with wooden walls, and about as big. But it is dry and warm and only about 15 km. from the big tourist center, which we'll go to tomorrow. We stayed up until 01:00 in the morning. The clouds were not solid and I had hopes of seeing the "Midnight Sun". And we did!!! Unlike our trip to the "Top of Europe" the weather cooperated with us in our coming to the top of the world. We climbed the ridge by our cabin at 11:45 PM and watched the clouds slowly form a hole in the north. These pictures were taken about 00:30 in the morning, halfway between midnight Daylight Savings Time and midnight solar time. The left hand picture is of Bob looking north into the sun, the right hand is of Kathy looking south with my shadow in the foreground. Below is our cabin (the left hand one) and some flowers, all taken without flash in the middle of the "night". I would think the locals could tell the time of day simply by looking at the position of the sun. It is like a huge "sundial". The sun is always above the horizon during June and July, but its position on the compass varies by the hour as it goes around in a circle. So by looking at it and seeing where it is, over that building or past that power pole or wherever, you could tell what time it is. In December it never rises above the horizon, so you better have a watch to tell the time then. Saturday evening (if such a term applies where the sun doesn't set) we went to the tourist center. Two hundred Nkr. ($40) each to get in. But that is what you come here to do. There is a huge souvenir shop, a restaurant and cafe, movie theatre and historical displays as well as the famous globe out on the cliff edge. 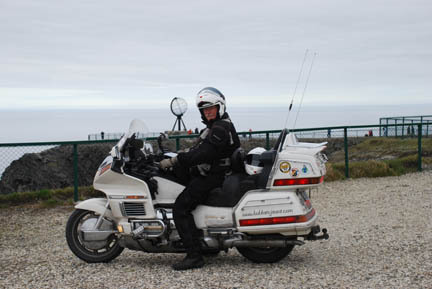 The location reminded me of the trip we made with the Portuguese GoldWing Club two years ago to the western most point in Europe, Cabo de Roca. We watched a very well done movie of the area with lots of helicopter and underwater shots. It was projected onto five screens creating a view 120 degrees (1/3rd of a circle) wide. We took our turns at standing by the globe. The tour buses were arriving and dropping off their passengers, another cruise ship had arrived at the dock in Honningsvag about 25 km. away. The hundreds of passengers and their "professional" photographers were hogging the stairs that took you up to the globe so we stood at the base and waited for the space when one group climbed down and before the next climbed up. It was almost as bad around on the side of the building where the motorcyclists were jockeying for position to get a picture of their bike and the monument. There are nine bikes in this picture, including ours. This is as close as any vehicle could get to it. Here is our picture. Another BTDT (Been There, Done That). Tomorrow it is on to Finland. We have several things on the list to see, including Santa Claus and the "Wife Carry Festival". Stay Tuned.